I've been building the perfect beast that is my CGC Death and Return of Superman set, going on 12 years now. This set is composed of many sets within, starting with the "Doomsday!" and "Reign of the Supermen!" 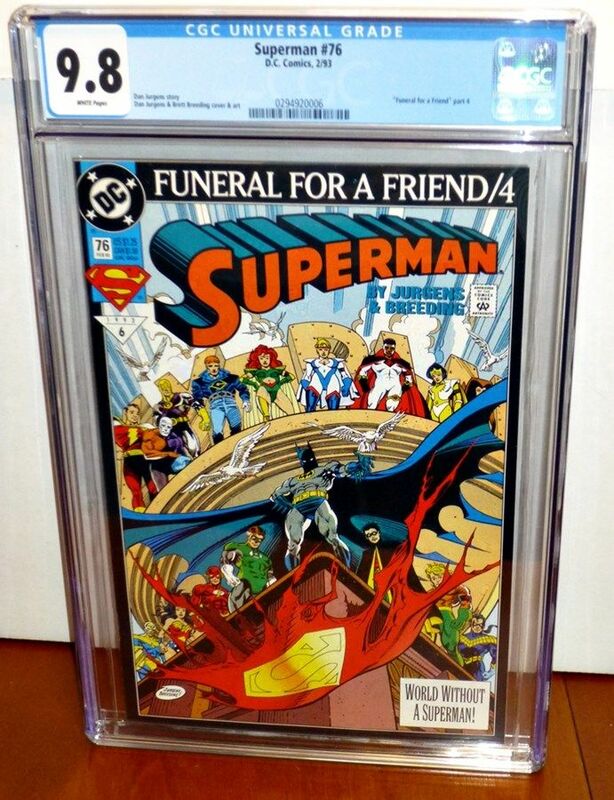 storylines, and then the multiple printings of various issues, platinum editions (Superman #75, Adventures of Superman #500), die cut covers and various collector's editions. Another such subset, or beast, is the "Funeral for a Fried" storyline, nine books that tell the story of a world without a Superman. I consider this the best chapter of the entire sage, those closest to Superman mourn with the citizens of Metropolis, other characters in the DC Universe, President Clinton and the rest of the world. With the exception of Superman: The Man of Steel #21, each cover is fantastic. Outlined with a black boarder, these books are hard to find in 9.8 grade. I scored Superman: The Man of Steel #20 recently, now I'm only three issues away from having all the first prints in 9.8 holders. The JLA #70 is on it's way to Sarasota for a new holder. I found Adventures #498 raw, it's one of my favorite books that I've submitted, I still can't believe my luck, those black covers are not forgiving when it come to defects. As for Man of Steel #20, I paid way more than I should have, but I really needed it, at least the book itself is very sharp, plus it’s a great cover.